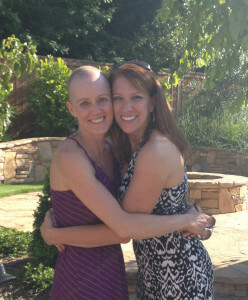 In 2011, when I was 37, I was diagnosed with breast cancer. It was devastating to me and my whole community. My friends and family wanted to show their support and love while I was going through treatment. I was pretty vocal from early on after my diagnosis that I wasn’t into the pink ribbon culture. And even years before my diagnosis I voiced my concerns about carcinogens being sold in the name of breast cancer. A couple friends offered to do walks in my name because they thought any money raised was a good thing. While I appreciated their support, I explained that raising money for the larger, more well known breast cancer organizations wasn’t necessarily a good thing. I was frustrated because I knew that pink ribbon events and purchases did more for bottom lines of companies and organizations than for women with breast cancer. I wanted to scream “don’t pink for me,” but I didn’t know what to tell my loved ones. In 2013, I joined the Board of Directors of Breast Cancer Action. I started telling my friends and family about my work with this great organization that was carrying my voice and the voices of other women like me to the FDA, to corporate headquarters, and even to the U.S. Supreme Court. I started my Don’t Pink for Me© fundraising page last October as a way for my friends and family to do something that makes a difference for me and other women living with and at risk of breast cancer. As a board member, I know we need to meet our fundraising target by June 30 so that we’ll have the funds to fulfill our plans next fiscal year. With everything from toxic cosmetics to pink fracking drill bits in the name of awareness, I know our work is more important than ever. I am committed to making sure that Breast Cancer Action has the resources they need to go toe-to-toe with corporate polluters, pinkwashing profiteers, and Big Pharma to put women’s health first. Please join me. Start your own Don’t Pink for Me© page and help us raise $25,000 by June 30.